I've been at a quilt retreat this weekend. 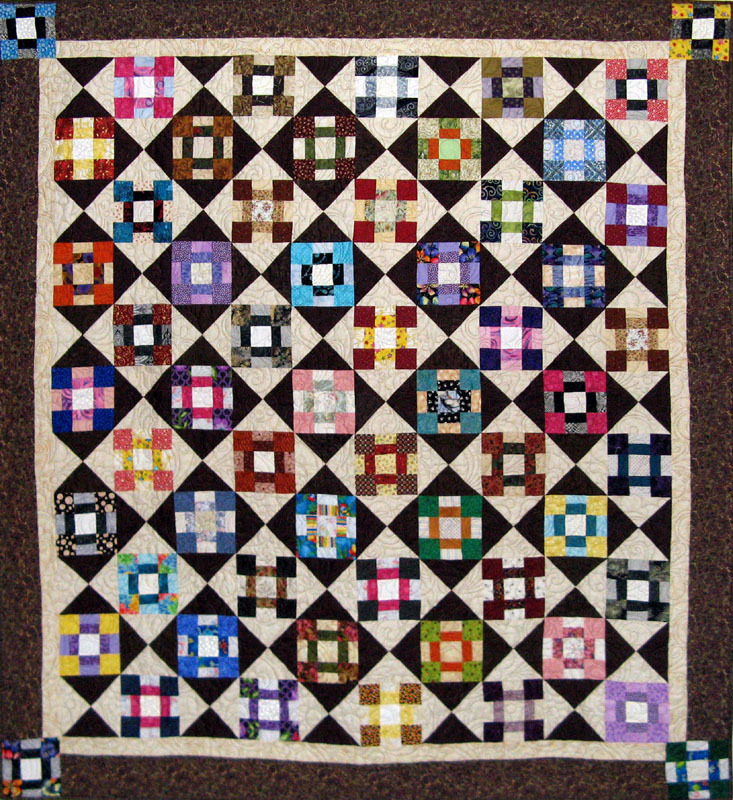 These are the blocks we gave to our quilt sister Shelly for her 50th. She was very pleased with her surprise. It is the Sister's Choice pattern by Bonnie Hunter. Did you have time to vote for me? 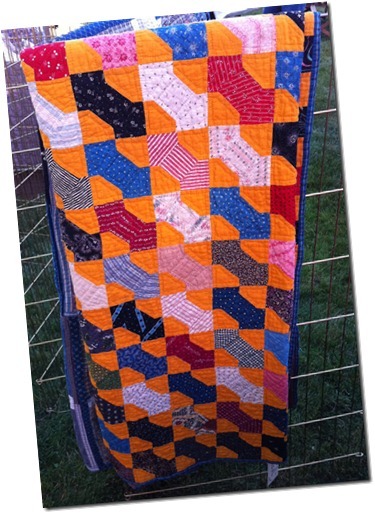 If not I'm running 4th in the competition with 30 other Group Quilt entries. Use the link HERE or the purple button on my right side bar. Help me close the gap! I've been good the one time we went to the local quilt shop this weekend. Purchased some Lite Steam-A-Seam 2, but no fabric. I have no finishes so no changes this week. I'll post later with some pictures of my weekend projects. 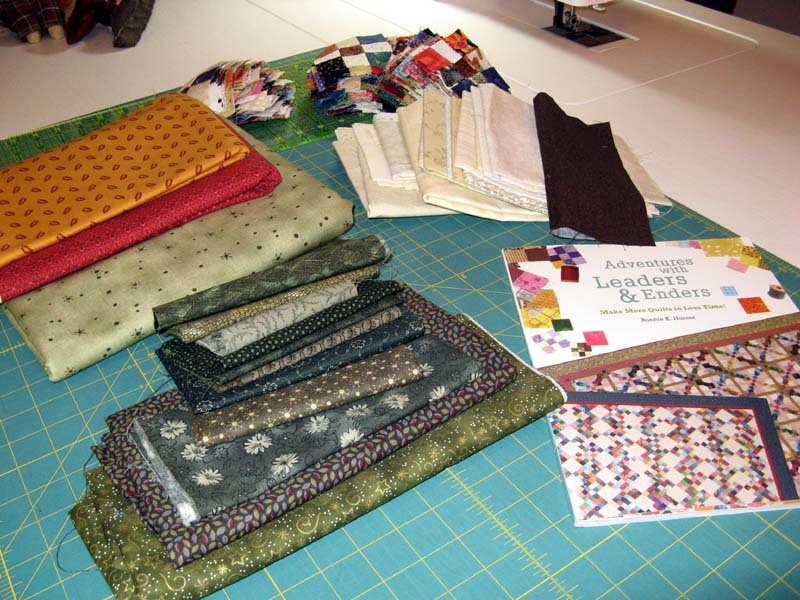 See what others are doing with their stash at Patchwork Times. 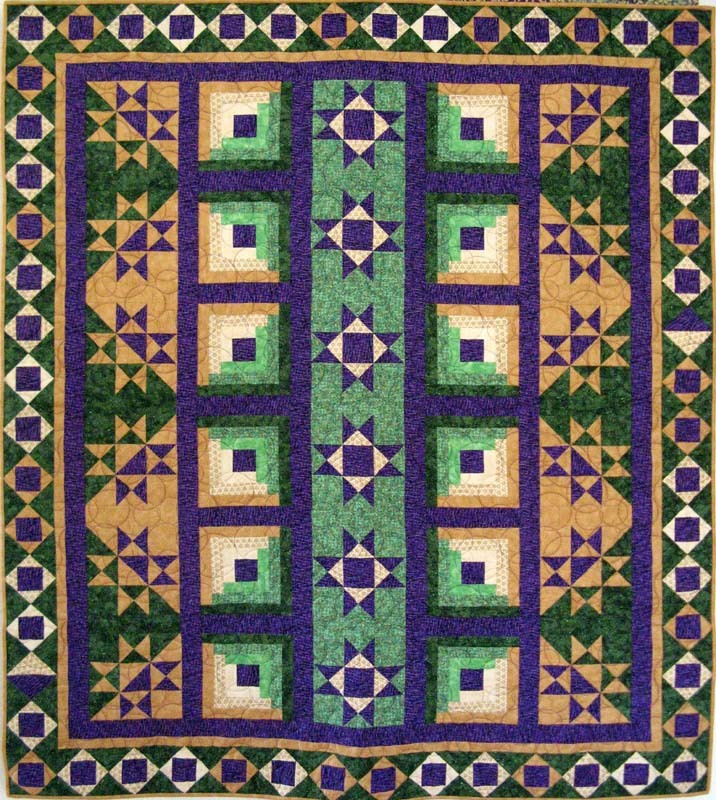 I'm in another theme contest with the Quilting Gallery this weekend. The theme being Group Exchange Quilts. If you find Keeping Kool worthy of a vote I'd love to have it. Here is the link for this week's voting. I know some of you had a difficult time voting when I did this once before. I hope it is smoother this time. You do have to scroll down a bit to find the voting buttons. Voting starts Friday, September 28, 2012 at 8:00 a.m. (EDT) and last until the following Monday, October 1, 2012 at 8:00 a.m. (EDT). 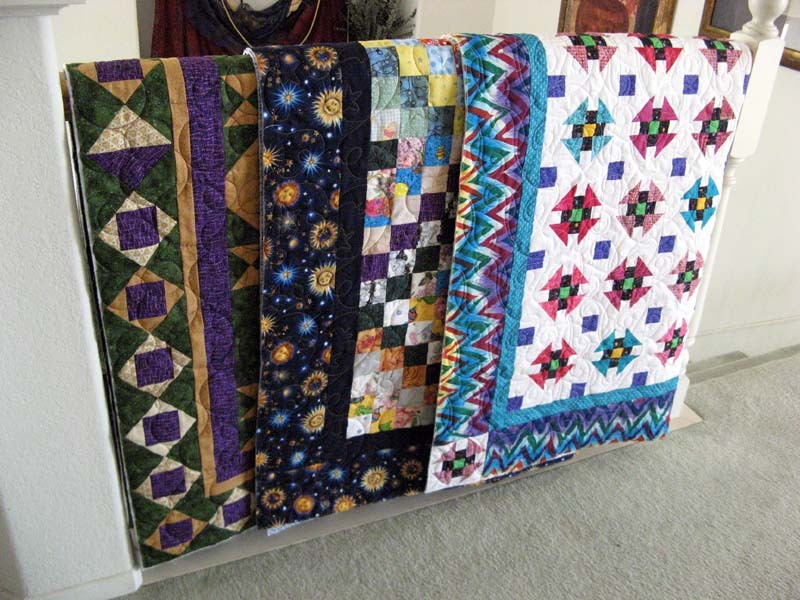 You can also get to Quilting Gallery through the button/link on the right that's purple called Weekly Themed Quilt Contests then select the link "Continue Reading". 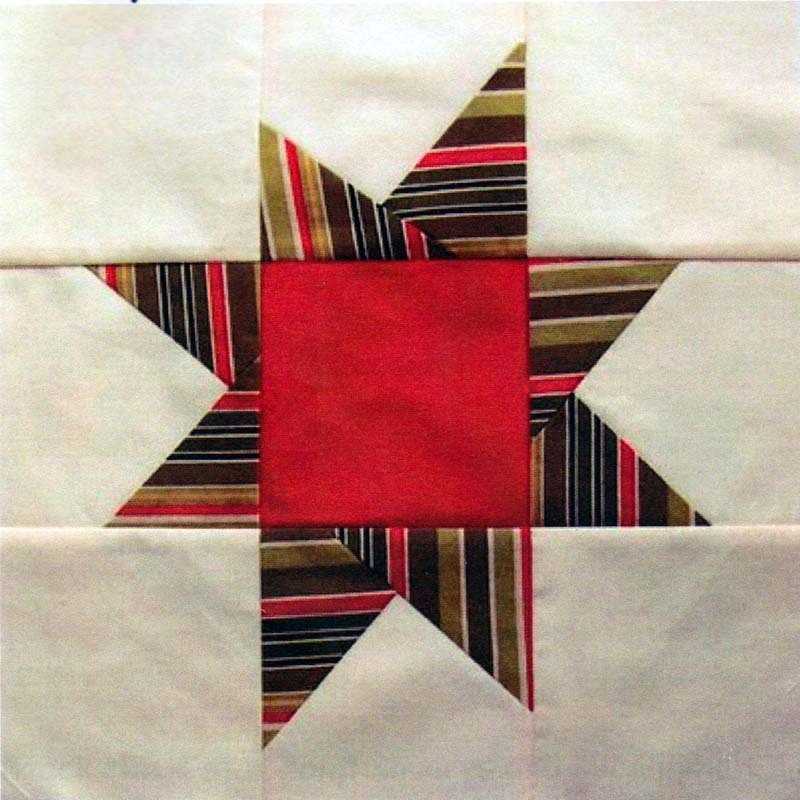 The theme that you'll be voting on is Group Exchange Quilts. 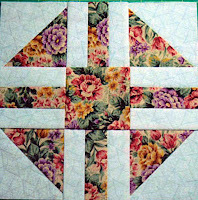 Some of you may remember this group challenge, a Row Robin, that was with Sunshine Quilt Guild in 2009. I started it off with the Dancing Sea Gulls in November 2009 and six rows later in June 2010 I got it back. Totally AWESOME! Everyone was quite creative. About half of the rows are 3-D. The shorts have elastic waistbands, and the shirts have buttons. There is so much going on with the sand/VW Van row you just have to enlarge the photo. Kerry's Quilting is who I had quilt it in a stitch that was befitting what was going on in the row. I finished it in February of this year. 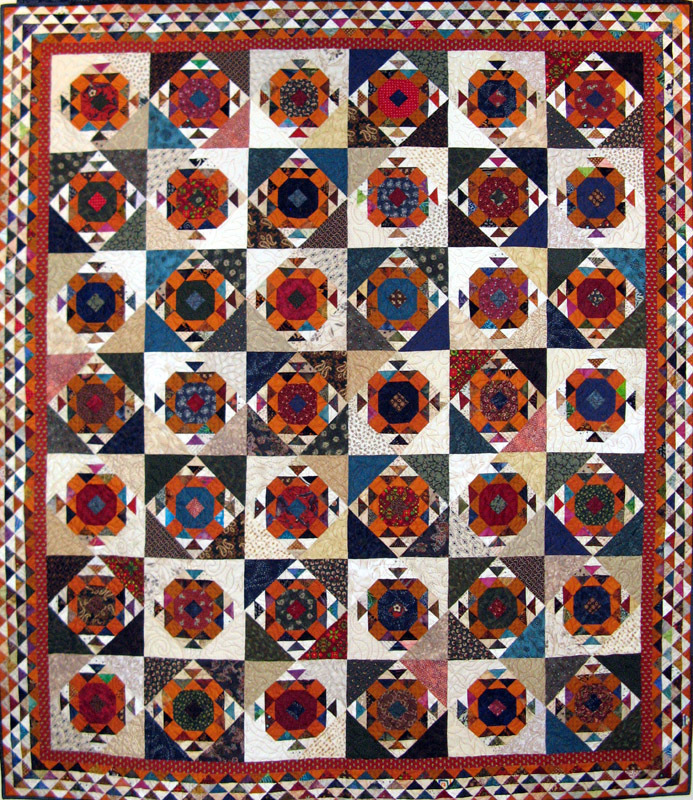 I'm quilt retreating this weekend! Vote for Keeping Kool! Get ready...get set...get retreat ready! Wednesday evening...eek...had to get lots of stuff ready...retreat starts today. I will be on my way there around 2pm. So not only did I finish getting Krayons sew ready. I made a streusel for the continental breakfast we'll be having each day through Sunday. A stop by the grocery store for chicken chili ingredients (Saturday night's dinner that Bonnie and I are responsible for); along with other food and beverage items to share with the other retreaters. Then the figuring out what to wear...just how hot will it get in Lakeside this weekend? Remember the dental floss...hmm what else goes with the toiletries...do I need makeup? 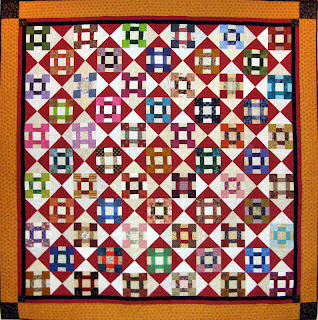 Krayons started in a workshop that I took at Road to California Quilt Show in January this year. It is the last of three projects I brought home from the show to finish. It is a neat idea, something I hadn't tried before. Taught by Karen Eckimer a way to create scrappy log cabin blocks by pressing under and top stitching the logs. 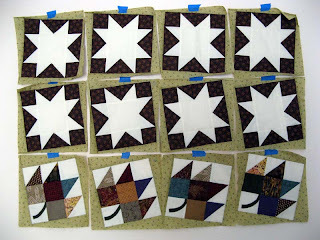 Next you sew the blocks and rows together in similar fashion. Add a few fusible embellishments and voila! 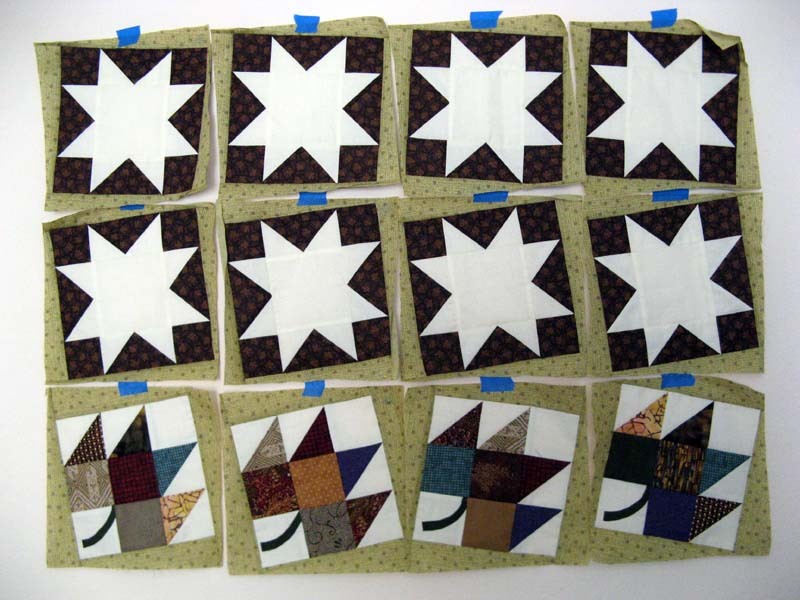 I made seven blocks during the workshop. I had brought a Bali Strip pack to use for the project, but as it turns out there wasn't enough contrast. During lunch break I was shopping for more batiks. 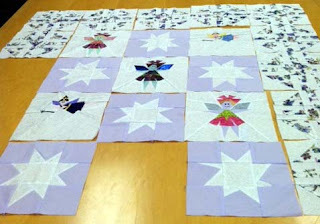 The project has 30 blocks with loads of embellishments. I don't know if I will make that many...I may just make my project a smaller version. Not real certain this is a technique that I am wrapped around, but I did enjoy trying it. Tuesday night was the evening for Kurly Kues. I have a 108 of these done, but I need a bunch more, 148 to be exact. This was a project started in 2011...intended as a leader and ender...and a challenge with Bonnie Hunter. The challenge was to guess how many Bonnie would have done in a year. I think someone actually guessed exactly. If you've been on her blog you will remember the cute bowtie pattern. It is a little block only 3.5" unfinished. I never much liked bowtie projects, but making the blocks smaller got me motivated! I leader and ender on each of the projects I work on so bringing in a second project doesn't work for me. Instead I cut the pieces when I have the right stash then sew up everything I have at the time. Wait until I have a bunch more to work on and repeat. Since I want to get the project done I'll cut a little bit of each of the blues and cheddars to finish the project. My project should end up 48" x 48". This cheddar fabric I got in the Sale Room at Rosie's should handle the back...if not I'll add some blue. After all it is a project that's meant to use stash! This instructions for this cute bowtie pattern can be found on Bonnie's Quiltville website under Free Patterns! called Cheddar Bow-Ties. Later this evening I'll be getting Krayons in order. Monday evening I busied myself with cutting pieces for Krabapple. 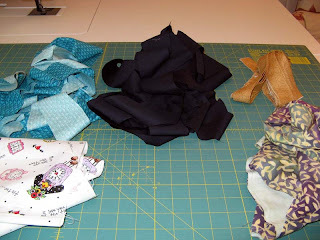 I want to sew at the retreat this weekend not cut pieces or realize I didn't bring what I need to work on a project. 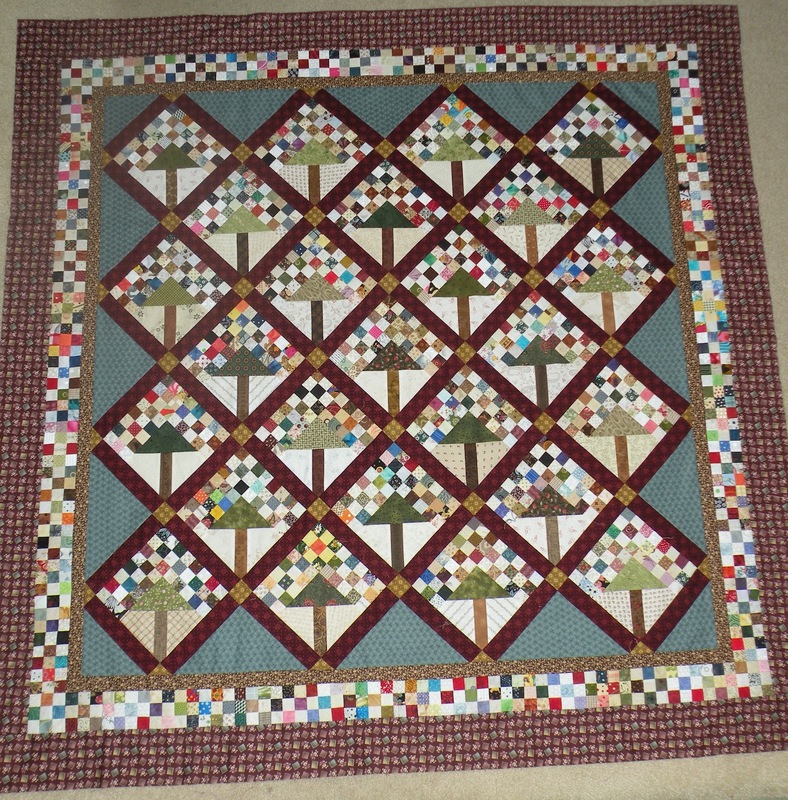 Sunday I pulled fabrics for the setting triangles, sashing, background for the trees, the trees, and the tree trunks. I'll be using a green for my setting triangles. I purchased this fabric when Amidon's was at their peak in discounting fabrics just before they closed their shop. Some time back I purchased a red fabric and a cheddar with a red design that will be used for the sashing. From my stash comes the trees and their backgrounds. Going for variety for each of these. I have a pretty good selection of brownish greens that go well with the setting triangle green. I'll be going with just one dark brown for the tree trunks. 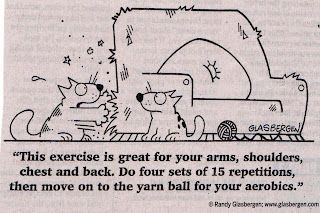 Tonight I'll get Kurly Kues together. I'm making progress finishing up the workshop sample for No Klucks Here! I led the workshop last Sunday for Friendship Quilt Guild at Paradise Quilters. I need some more Steam A Seam 2 Lite to get the four turkeys put together. I only had enough to start on the feathers. This week I'm gathering up what I'll need for the quilting retreat that starts on Thursday. Sure hope it doesn't end up being a really hot weekend. Four projects are going into my car. This way I'll have enough to work on and whatever inspires me most will be right at my fingers. No Klucks Here Either!, Krabapples, Krayons, and Kurly Kues are all started with each at about the same stage of completion. Hope your last week of September is full of what makes you most happy! 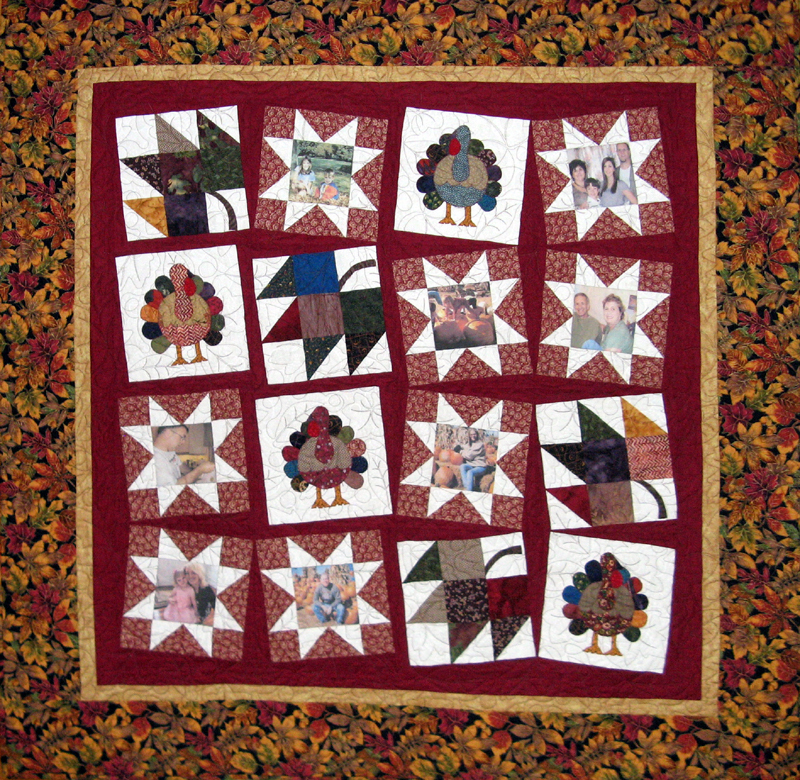 See what other quilters are doing at Patchwork Times. Labels: Design Wall, Krabapple, Krayons, Kurly Kues, No Klucks Here Either! I finished binding Klowning and Kollinwood Konnections this week. Kerry liked Klowning so much (Bonnie Hunter's Little Monkey) while she was quilting it that she's started one to use as a gift. Her's will look so different with the fabrics she will be using. 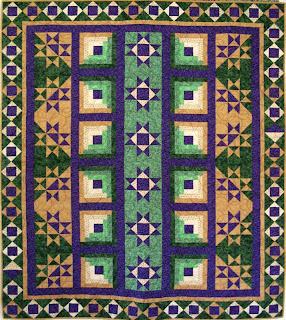 Kollinwood Konnections (Judy Laquidara's Road to Brownwood) looks has a great circular pattern for the quilting in purple thread. 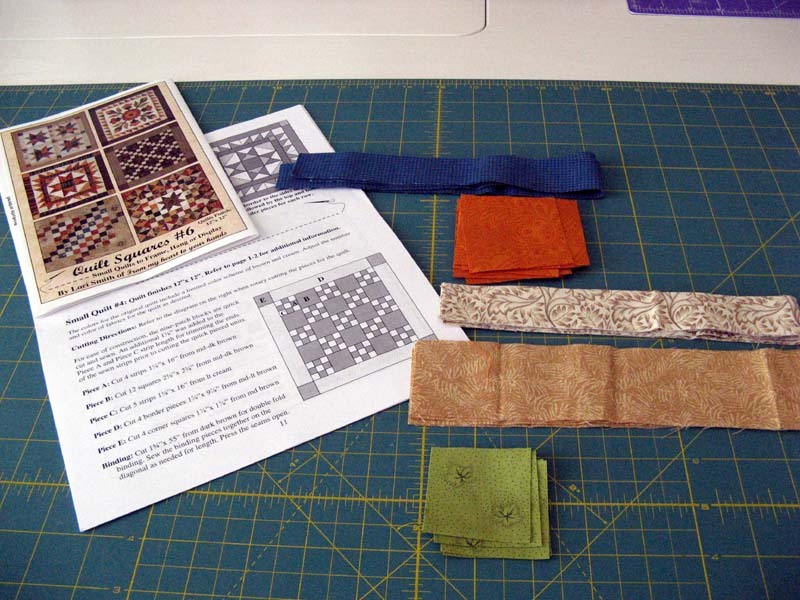 Next for binding is Kontinental. 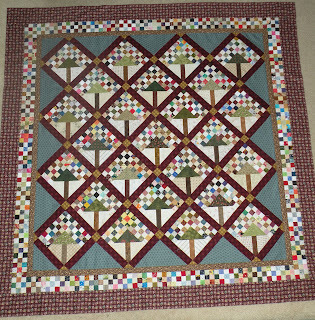 I also have several participant labels to sew on the quilts I entered in the San Diego Quilt Show. No changes this week. But I do need to get some Steam A Seam 2 Lite so you know what that means....fabrics! Hope I stay strong... See what others are doing with their stash at Patchwork Times. Hope your week's been good so far. 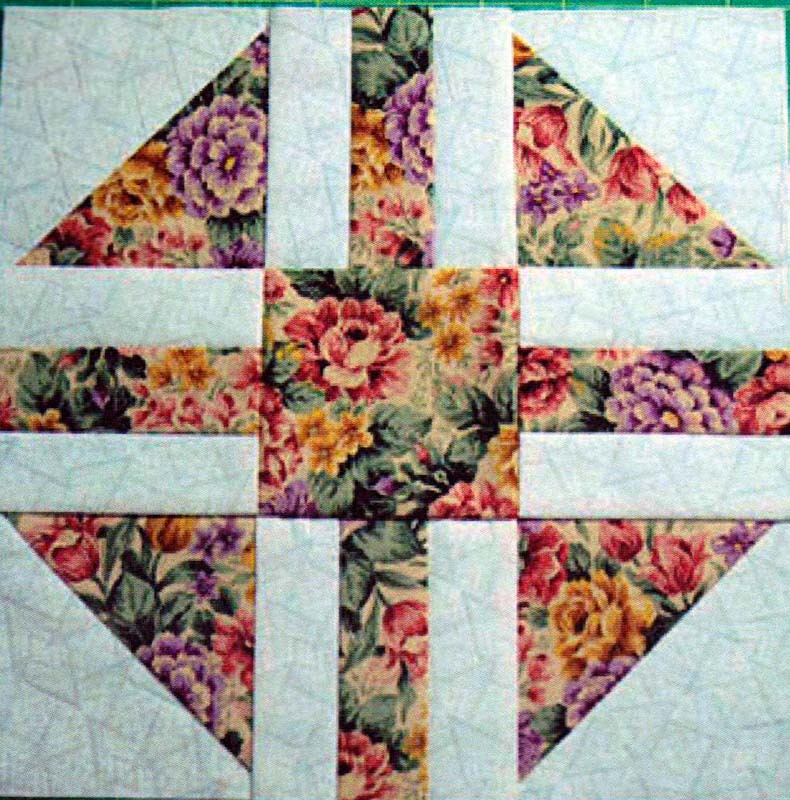 Several quilting sisters have been making blocks to present to Susan for her big birthday...one of those that end in a zero! 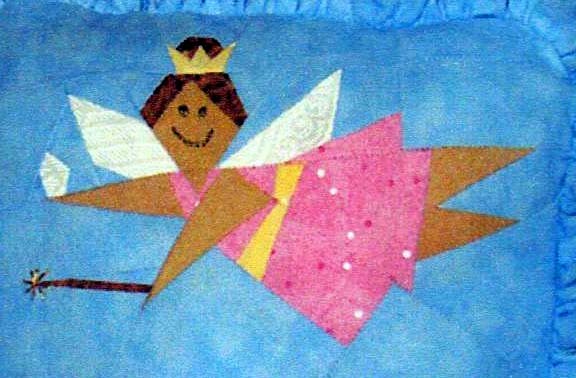 Susan likes fairies so we made blocks in four different designs with that theme in mind. We gave her the special gift just yesterday. She was so happy! I don't have the best of photographs, but hopefully she'll share a picture when she has the project assembled. These are the four patterns we used. 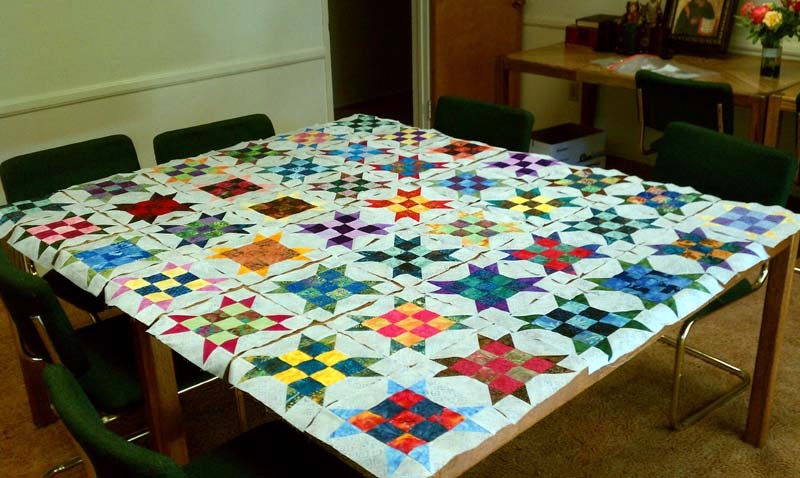 Kollinwood Konnections is the first of the three quilts to put binding down. I figured I would start with the largest of the three. I'm on the last long side now. I should be able to finish it tonight. Next to work on will be Klowning. I've got the binding machine stitched down and ready to go. During all the binding projects I have been thinking about what I'll take to work on at the quilting retreat that starts next week for three days. There are eight of us attending this year. It would be nice to finish a few projects that I have started instead of something new like I usually do. 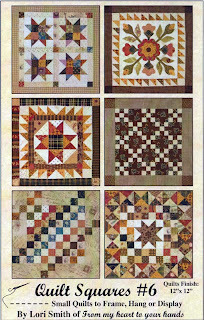 My Bonnie Hunter Crabapple project from the swap just turned in a couple of months ago might be the project or perhaps I'll just get busy on one of the last two UFOs for 2012 with Patchwork Times. I was busy on Sunday teaching No Klucks Here! at Paradise Quilters in Escondido, CA. No time for any sewing until way late in the evening. 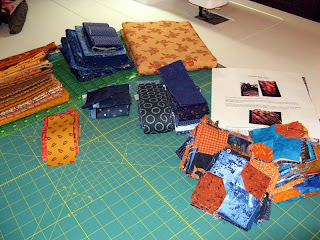 I got the bindings and sleeves all pressed and ready to attach to my newly quilted quilts. Klowning, Kontinental, and Kollinwood Konnections. Klowning and Kontinental are both Bonnie Hunter designs (Little Monkey! and Take A Scrappy Trip Around the World!). Kollinwood Konnections is a Judy Laquidara design (Road to Brownwood). 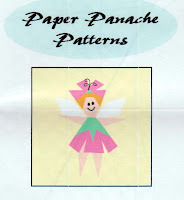 All of these patterns can be found on their websites. 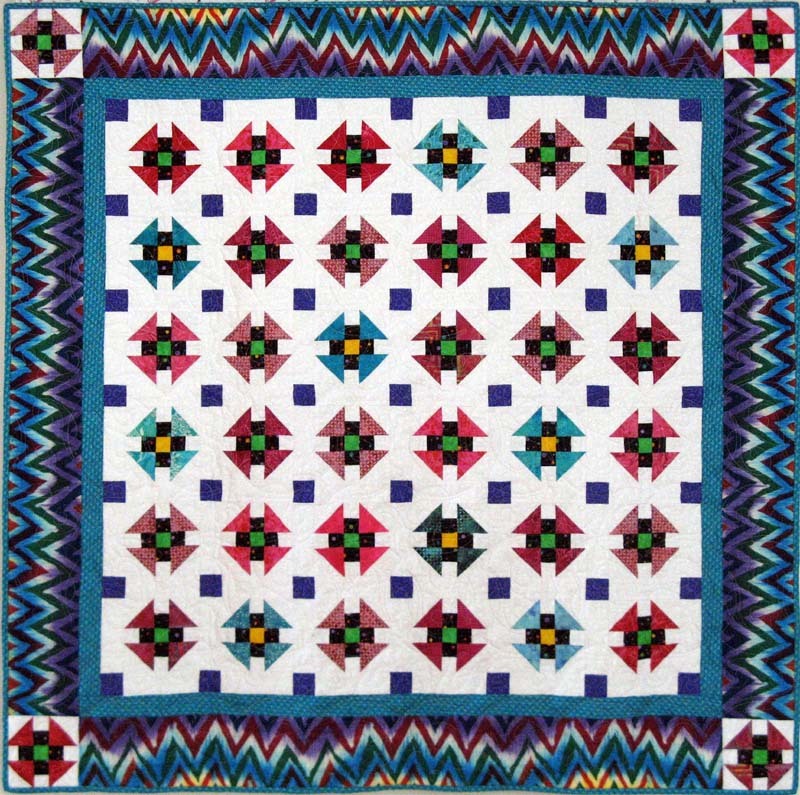 I didn't get a chance to go this year to the San Diego Quilt Show that happened this past weekend. I heard good things about the new format and the volunteers organizing the event. 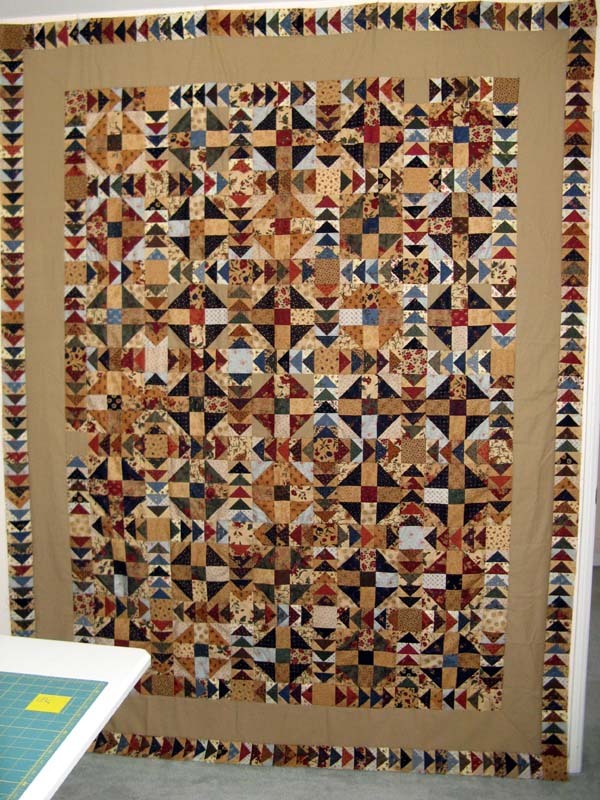 I had five quilts displayed. Kerry went to Preview Night and took photos for me of my entries. I did have a completion in Korabell and her three Kitties over the weekend. Hope to work on my class sample of No Klucks Here! 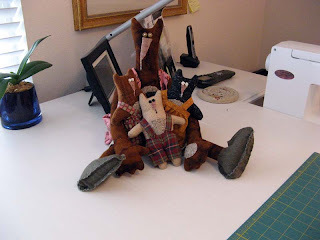 this week along with hand sewing the bindings. 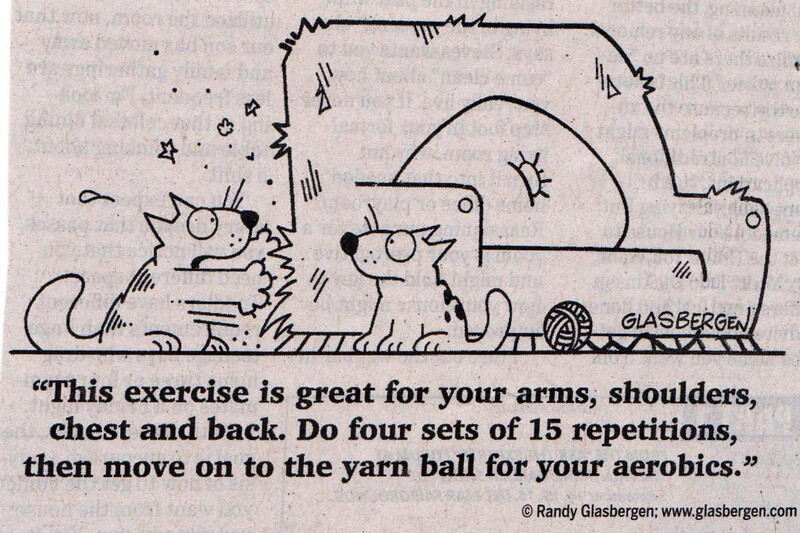 It is sure to be a busy sewing week. 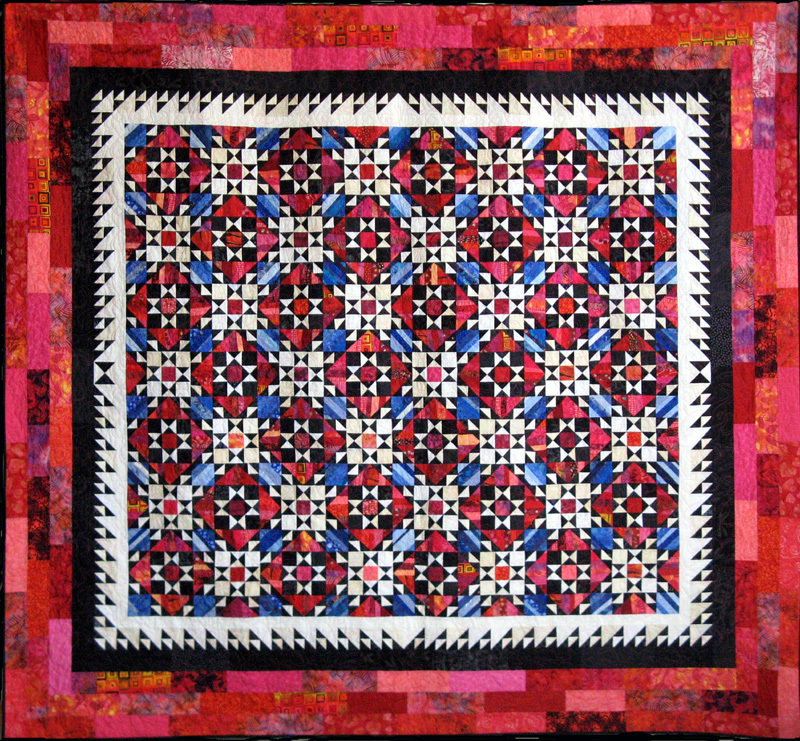 Tonight is Canyon Quilt Guild's September Meeting. 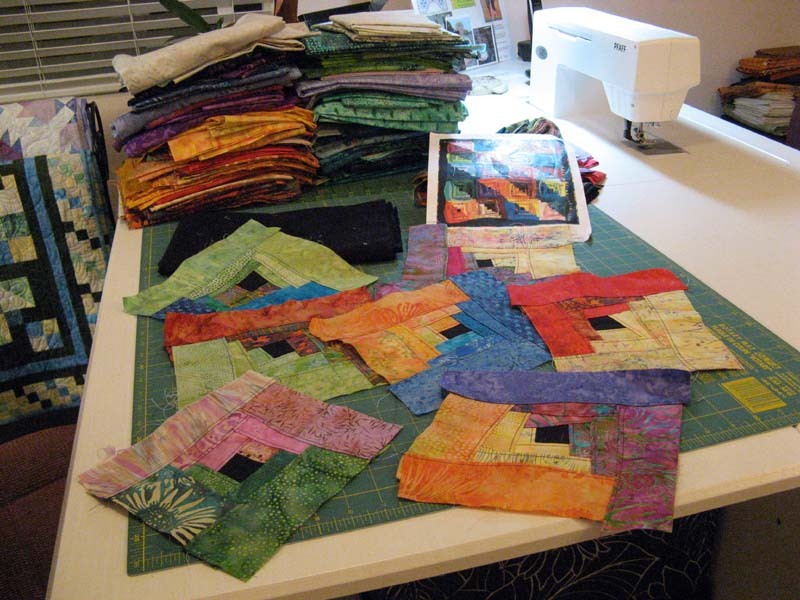 Harriet Hargrave is our speaker who will show us a trunk show of her wonder machine quilting. Labels: 2012 UFO, Design Wall, Klowning, Kollinwood Konnections, Kontinental, Korabell, No Klucks Here! Korabell with her kitties Krissy, Kitty and Karl are done! I decided this weekend to get this very cute cat doll done. She's been sitting waiting in a dark box for nearly two years now. 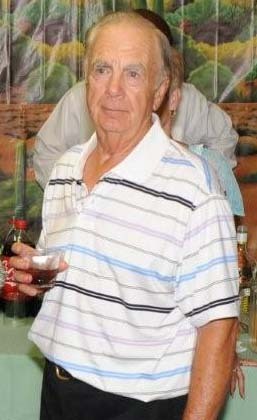 I took this class at Country Loft on my Birthday in 2010. Gosh time does fly! Saturday I picked up three quilts at Kerry's Quilting. I have the bindings started on all three. Next is the iron and the sewing. I'll share more information on these three projects tomorrow. Now it's off to Quilters Paradise where I have a class to teach! No changes this week. 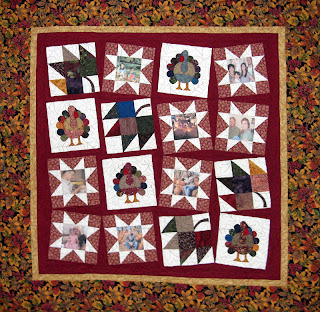 See what others are doing with their stash at Patchwork Times. 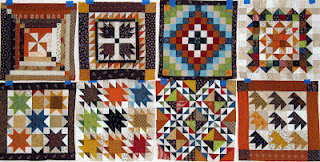 I'm part of Jo's Country Junction Quilt Square Quilt Along. 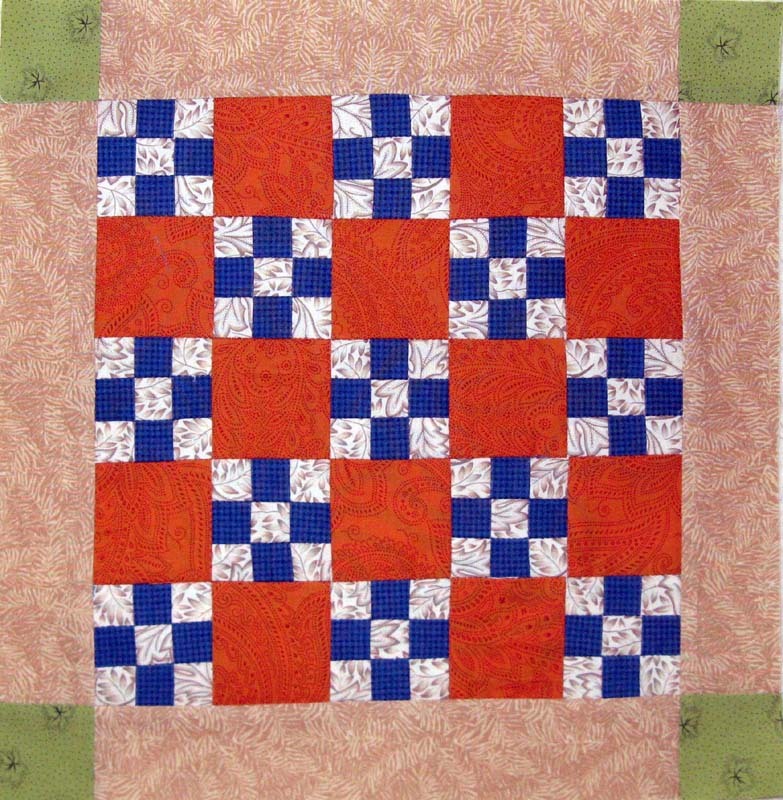 This month we are to make the 9-Patch Square. Those little 9-Patch blocks are just too cute. 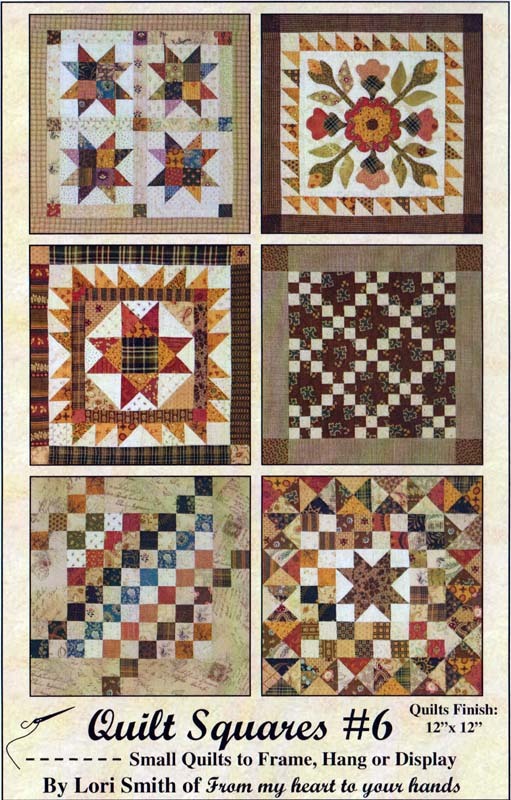 Next month Jo will select another from Quilt Squares #6 pattern by Lori Smith. 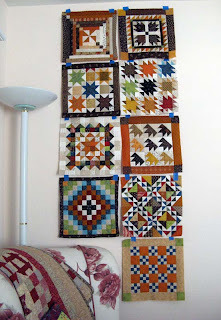 I'll be making my quilt squares into a sampler quilt so planning the colors for the next three blocks is important. Here are my blocks through September. 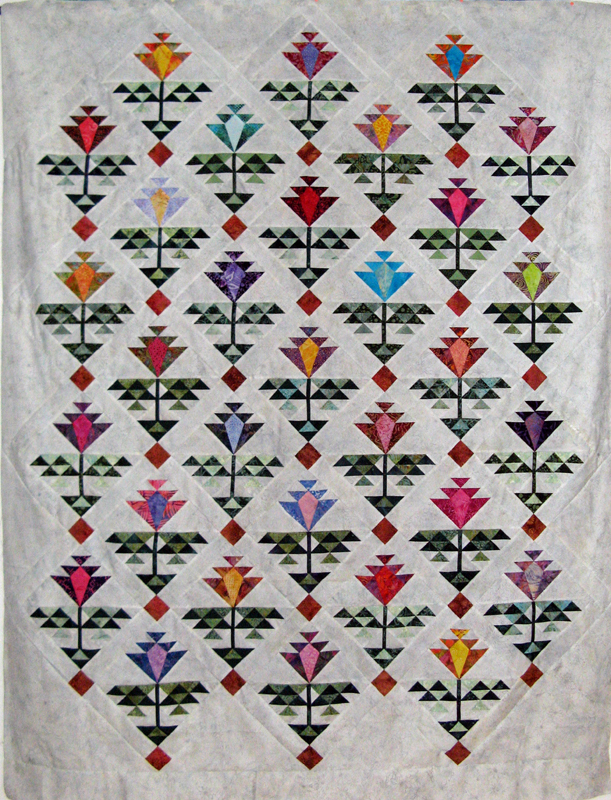 San Diego Quilt Show turn in of entries is today. I'll be heading to Rosie's in La Mesa at lunchtime to turn in five of mine (Kolonial, Kordova Klosure, Kondor's Klutch, Kamile, Klunky Korners) and one of my Mom's (Chunky Cheese). Preview Night is Wednesday with the Show running Thursday through Saturday at the San Diego Convention Center. 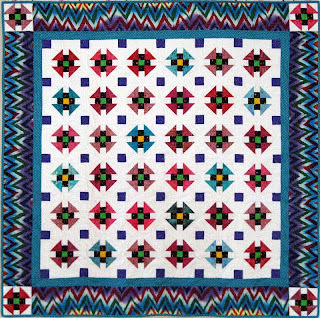 Later this evening I'll be attending Friendship Quilt Guild's September meeting. Friendship has invited me to teach No Klucks Here! on Sunday at Quilters Paradise in Escondido. I'll be on hand at the meeting to show the project and answer any questions students might have. 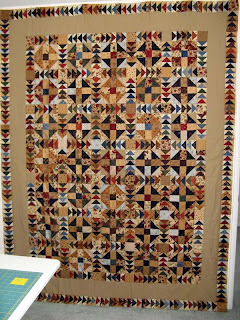 If you have time lots more quilters are sharing their Design Walls through the links at Patchwork Times. Enjoy your sewing week. Labels: 2012 UFO, 2017 UFO, Design Wall, Kamile, Klunky Korners, Kolonial, Kondors Klutch, Kordova Klosure, Kountry Kollection, No Klucks Here! For this week Kaktus gets counted! I'm still ahead by one UFO. Knoted and Kooky Kins are my last two to complete in 2012. I will probably try to get a head start on one of these this month. 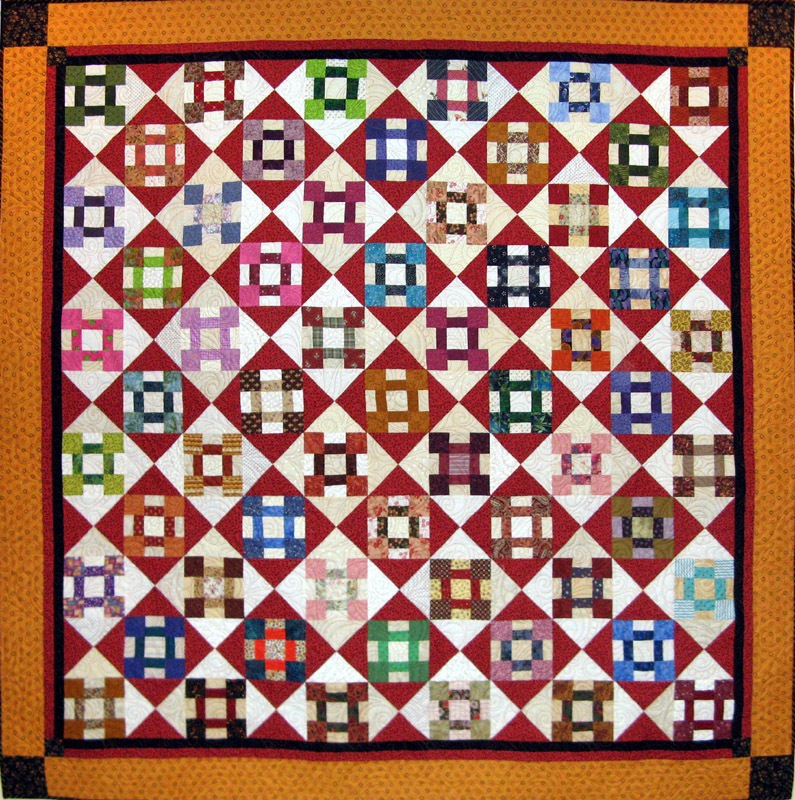 See what others are doing with their stash at Patchwork Times. 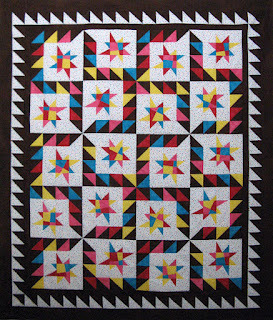 I'm with Jo's Country Junction Quilt Along making one of Lori Smith's Quilt Squares each month this year. 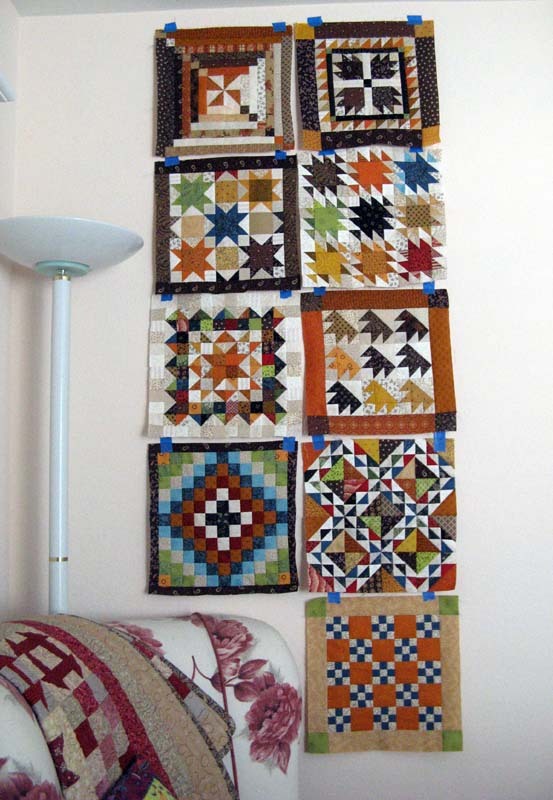 Jo's given us the one to make in September and it's the 9-Patch pictured in the middle row on the right. 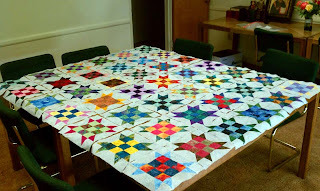 We have just four squares yet to make so I'm thinking of colors to make my sampler quilt blocks work together. I think I need to pull in some more blue and maybe red. I have a block that reads blue that I'd like to blend in a bit more than it does now. These are the blocks through August. The third one in on the first row needs a companion don't you think? Today I have another Crabapple top to share with you. This one is Jennifer's. I like the lighter look that the setting triangles created. Each and everyone of the projects so far from this swap have looked different. I've been trying to figure out how to set mine...each time I see another one I get more confused. Anybody else close to completing their project from this swap? Great job Jennifer! I've been busy with family this weekend, which puts me behind on blog posts! So let's catch up a bit. 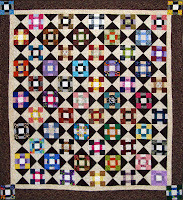 My August UFO #7 is Klappers which was done early this month but only posted the link to Patchwork Times just today. My September UFO #11 is Klunky Korners which I'm excited about since it is already done! Klunky Korners was done as a swap that I coordinated earlier this year. 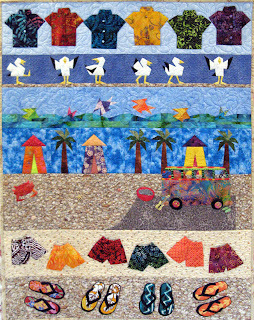 It is also an entry in the San Diego Quilt Show which is this September 13-15. HERE are my 2012 UFO Challenges that will give you information on both of these projects. I've not been able to sew on Kaktus since last Sunday. I have five rows yet to sew to the top before the outer borders can be put on. 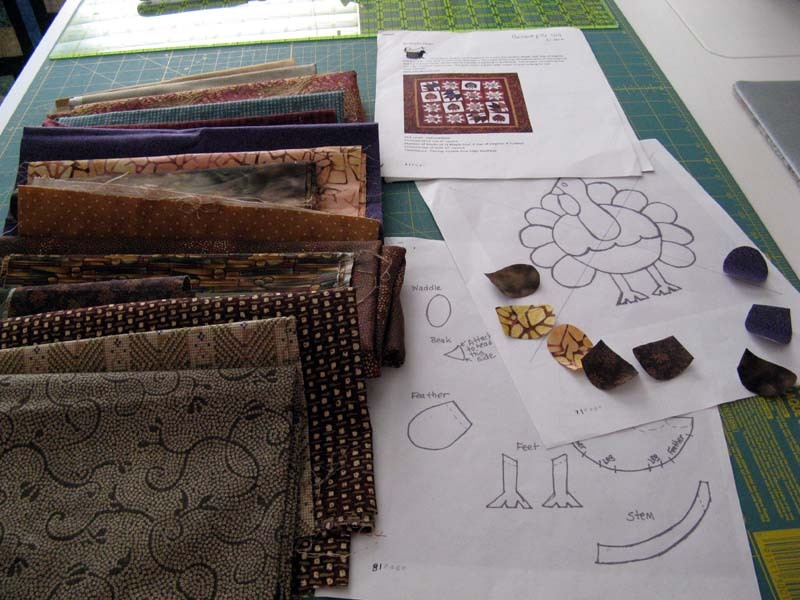 The flying geese foundations are ready; just need time in the sewing room. While I've been visiting my family my Pfaff is being serviced. It should be ready for me to pick up when I get home. Hope you have a wonderful Labor Day. 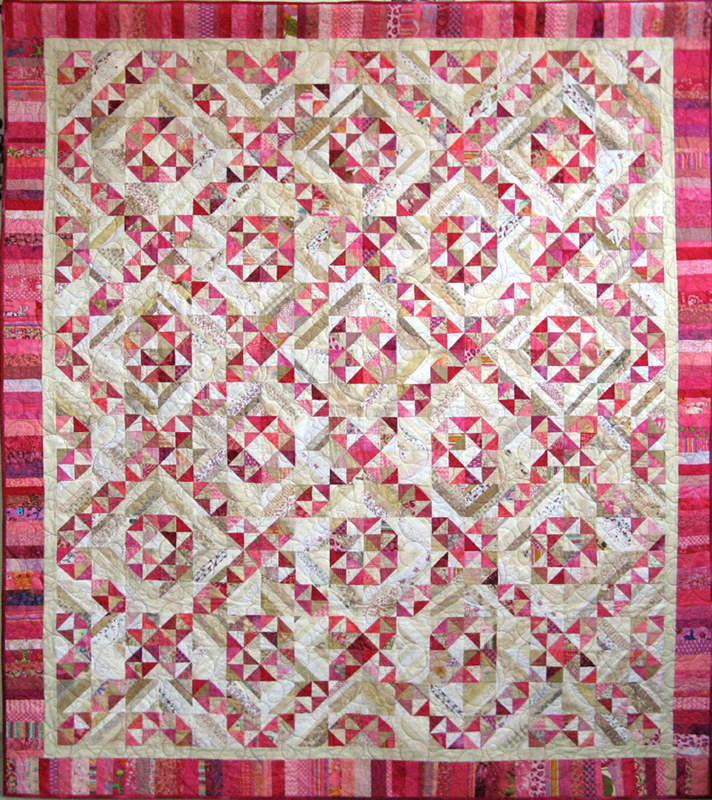 If you find you have time see other projects from quilters around the globe at Patchwork Times. Today is my Dad's 83rd Birthday. I surprised him with an all too short visit. I waited to tell him I was coming until I was about to board the plane. It is a long flight from San Diego to Baltimore! As what's become too common we had several twists in the route from Baltimore to the town where my parents live. Needless to say the two hour drive turned into more like three, but we did get through it safely. Our first day had us at National Harbor for a family luncheon that was terrific. I usually leave the outdoor grilling to my Husband, but decided to take on the challenge for Saturday's dinner. Five us for baby back ribs that I'm still patting myself on the back for a job well done. Sunday I made beef brisket tacos with all the fixings for a feast for nine of us celebrating Dad's birthday. We had not one or two or three desserts, but four! For this week nothing to report as used or purchased. Kaktus might be next week... see what others are doing with their stash at Patchwork Times.